There’s nothing quite like driving north on the Icefields Parkway through Banff and Jasper National Parks and seeing the scenery start to change from green to white. As the lush forests of Alberta start to give way to snowy mountain peaks, it becomes clear why this is one of Canada’s most scenic areas. 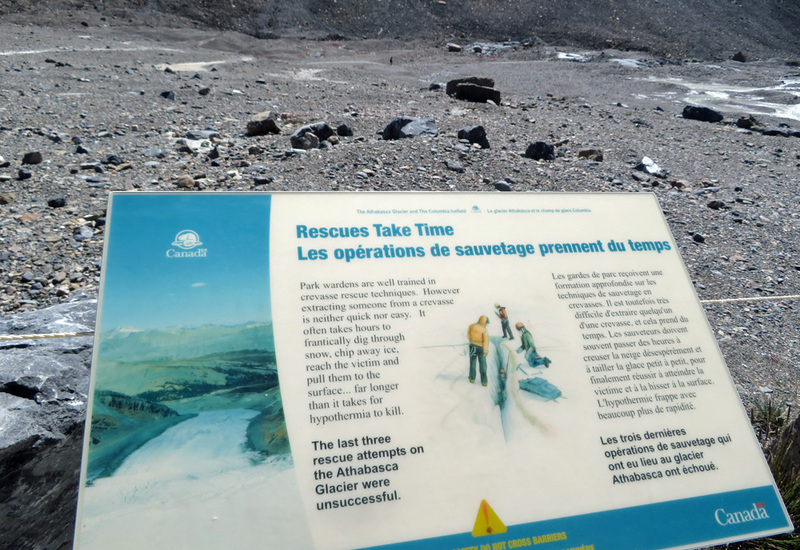 Before long, Athabasca Glacier emerges. Though it’s lost half of its volume in just over 100 years, Athabasca still appears impressive as it snakes it way down between peaks to end not far from the main road. Athabasca is one of the jewels of Jasper. If you’re looking to visit, you’ll have some questions. How close can you get to the glacier? Can you walk on it? Is hiking on the glacier dangerous? What’s the best time of year to visit? Keep reading for a report from my visit to Athabasca this past summer, as well as tips for getting the most out of your own visit. Athabasca is right across the street from the Columbia Icefields Visitor Center (aka, Discovery Center). That’s the spot where visitors can buy tickets to Jasper’s famous Skywalk, the glass floor that extends off the side of the hill. From the center, you can grab a bench and eat lunch while taking in some incredible views. Informational signs explain just how far Athabasca has receded in the past 200 years. In fact, the entire area where the Discovery Center and the parking lot stand today were covered by the glacier just a couple centuries ago. Today, you can drive right to its base. Parking can be difficult during the peak summer months, but you’ll most likely find a spot somewhere. 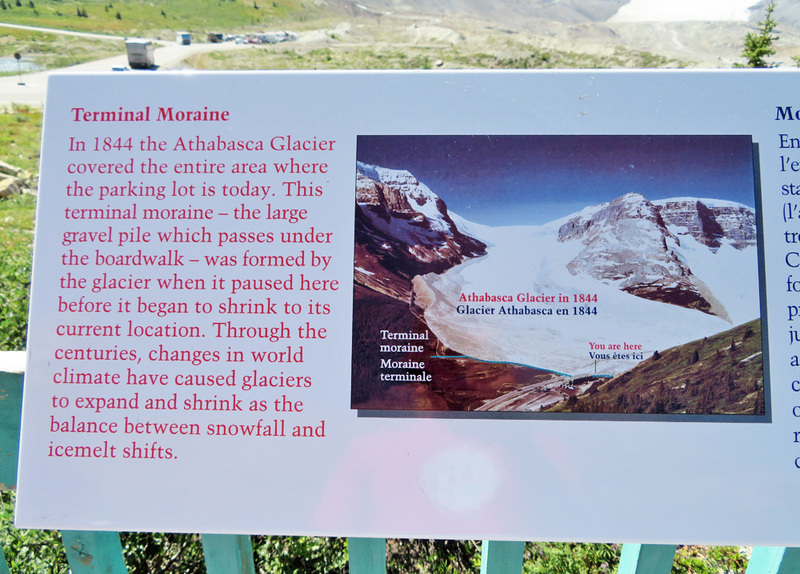 Depending where you park, you’ll still have to walk at least 10 minutes or so across a gravel and dirt path to get closer to the glacier. Get out and follow the crowds toward the foot of the glacier! Despite how much mass Athabasca Glacier has lost in the past couple centuries, it’s still pretty huge. 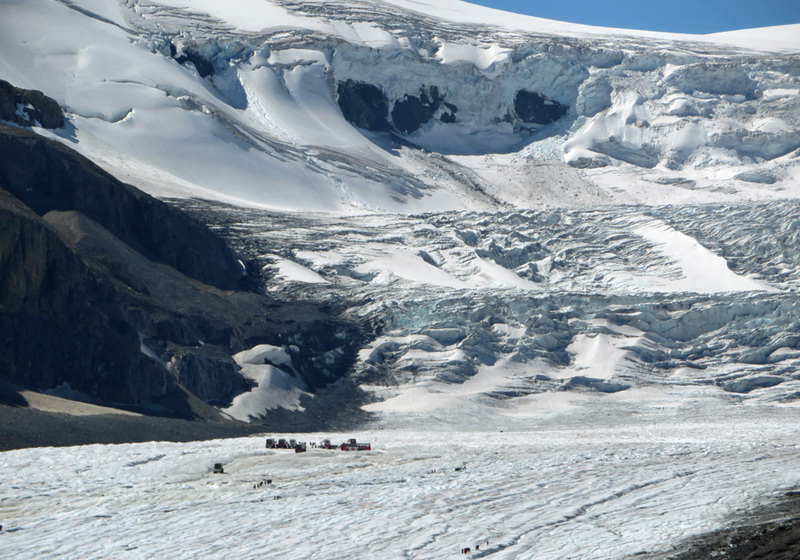 Just look at how tiny these distant hikers and snowcoach vehicles look compared to the glacier. If you want to take a joyride on the glacier, book a tour with the Ice Explorer. You can ride in a snowcoach, get out and walk around on the glacier, and even drink clean water from its streams. 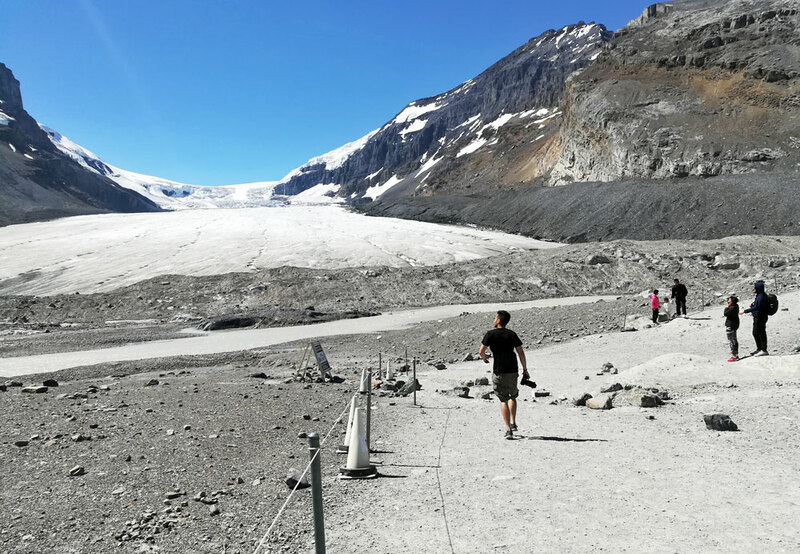 Can you walk on Athabasca Glacier? You’re not supposed to, unless you take a glacier hiking tour. 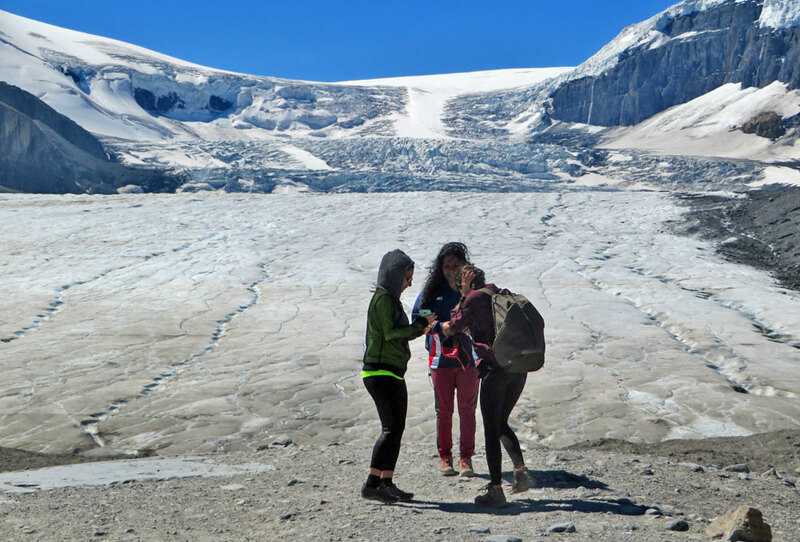 There are guided ice walk tours that provide a safe environment to do some hiking on Athabasca Glacier. Small fences constructed around the glacier urge people not to venture out onto the glacier. Some folks still do it anyway. But it’s not advised. Stick with a tour if you really want to feel the ice up close. In 2014, a body was discovered of a man who disappeared on the glacier in 1994. In 2018, a hiker fell into a crevasse but was able to get himself out. Clearly the glacier is more dangerous than it looks. Follow mountain safety guidelines if you decide to venture out onto the glacier. 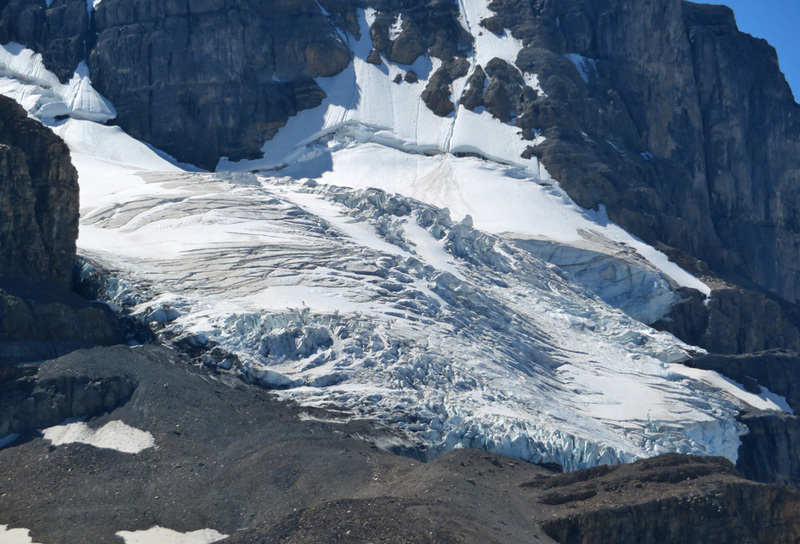 In terms of weather, the best time of year to visit Athabasca Glacier is the warmer summer, from June through August. You can still come in winter, but you’ll be risking snowstorms and possible road closures. Cell service doesn’t exist on parts of the road, so don’t visit during this time without winter tires and an emergency kit in case you get stranded. For the latest Icefields Parkway conditions, see the AMA page and choose “Route 93,” or check the traffic maps on 511 Alberta. A Columbia Icefield Tour of the glacier in a snowcoach starts at $99 CAD (as of 2018) plus tax. 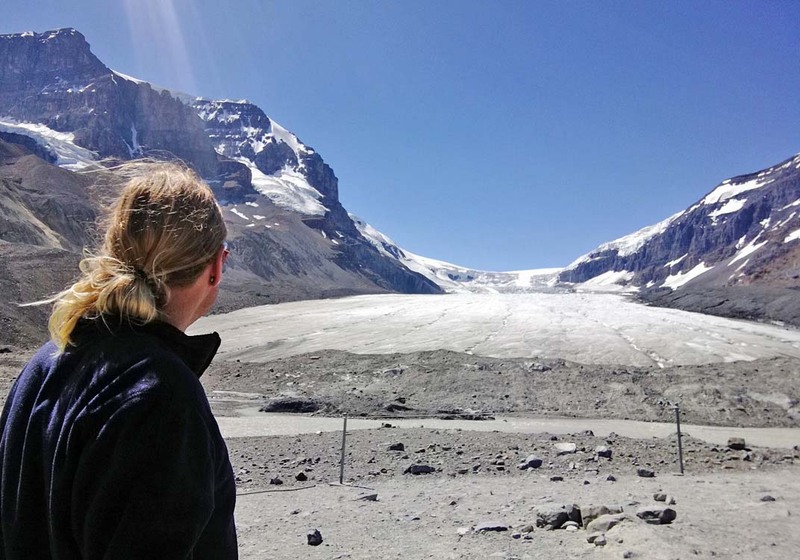 Glacier hiking tours start at $105 CAD (as of 2018) plus tax. The shorter tour runs three hours and children must be at least 7 years old to participate. A longer six-hour trek costs $175 CAD plus tax. Book in advance to guarantee your spot. Make sure to bring a good camera. I love the Canon Powershot SX720 because it has great zoom and it’s a pocket camera that gets photos the same quality as a fancy DSLR camera. Jasper National Park has some first-come, first-serve campgrounds, but they can fill up during the busy summer months, so I recommend booking your lodging in advance. 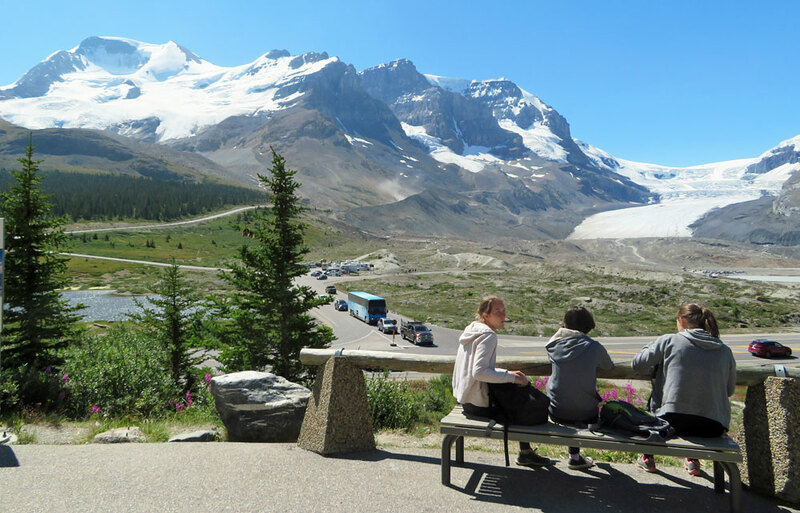 There aren’t a ton of hotels near Columbia Icefields. 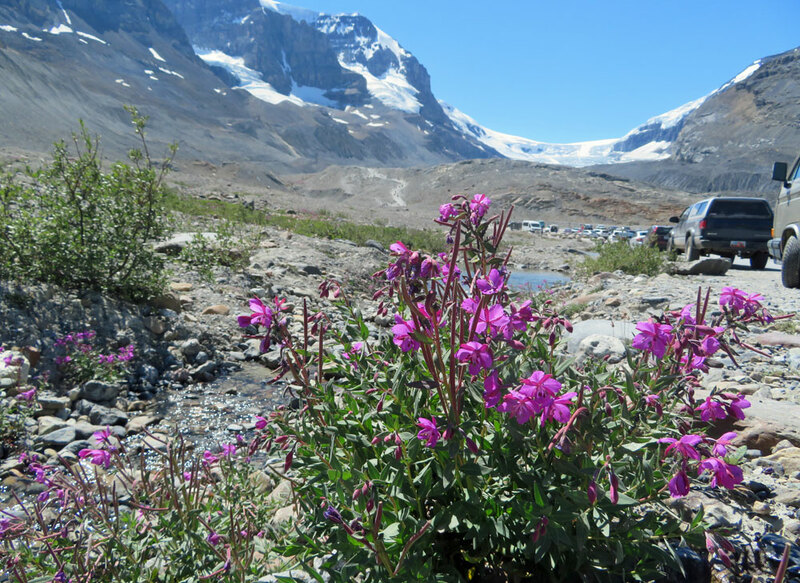 The closest hotels to Athabasca Glacier would be the Glacier View Inn and the HI Hilda Creek Wilderness Hostel. But you can always spend the night in the town of Jasper itself, or even Calgary or Edmonton if you don’t mind waking up early to drive a few hours into the park. See a list of available hotels in the Jasper National Park area.